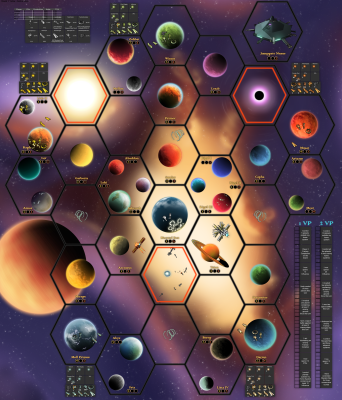 From the creator: "This is an adaptation of the board game Twilight Imperium and it plays quite a bit differently from Axis and Allies. I primarily made this as an alternative for the HTML PBEM TI systems that exist, and allow groups of people to play real TI long distance with only one copy of the game. But, even without all the cards that come with the game, it stands alone just fine as a good game by it's own right." EB: "I am taking a risk here, putting it in the main section right away, since I did not test this mod. But it is so awesomely well done, looking great, perfect documention, and it is also based on an established board game, that I trust it in terms of balance and mechanics."